1 Million for Work Flexibility has more than 100 organizations on board to date as part of our coalition—and counting. We’re pleased to share more information about our supporter The Telework Coalition in today’s “Spotlight On…” post. 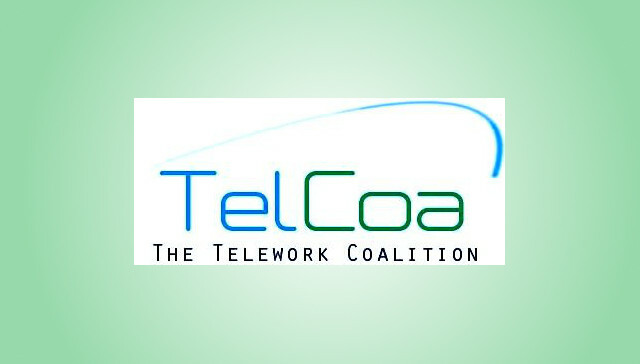 The Telework Coalition (TelCoa) is dedicated to promoting telework and telecommuting for workers everywhere, leading the charge to help companies and other institutions implement telework policies that benefit all. TelCoa has its hands in creating change in the workplace across the spectrum, from small grassroots efforts to helping support legislation to make telework a reality for U.S. workers. TelCoa aims to boost awareness of the benefits of telecommuting, including improved work-life balance, a reduction in traffic, boosted levels of productivity for workers, as well as better employment opportunities for workers who might be geographically disadvantaged, people with disabilities, older workers, and military spouses. TelCoa is also working to help companies understand that telecommuting and telework is one of the greenest ways to conduct business. TelCoa recognizes that in order to enact change, it’s key to educate federal, state, and local elected officials (both in the public and private sectors) on the benefits of telecommuting. To that end, TelCoa has created strategic alliances to help further achieve its goals. TelCoa works with policy makers to design incentives for companies who are reticent to adopt telework policies (such as tax credits for employers who opt-in to telework programs), and aims to inform the public of these initiatives to further aid in their adoption and implementation. One significant area of focus for TelCoa is its support of the Multi-State Worker Tax Fairness Act. This bill, designed to eliminate the double taxation many remote workers contend with, would aid adoption of telework by remote workers and employers who are otherwise fearful of it due to heavy taxation penalties. The Telework Coalition has its hands in many areas of the telework movement, from working with legislators to adopt new laws, to working to help improve the environment through telecommuting.